In December of 2005 Car & Driver magazine tested a pre-production C6 Z06 at Grattan Raceway Park in Belding, Michigan. They complained the car was too stiff for such a rough track saying, "If the Z06 encountered any kind of bump or lump in the pavement as it was exiting a corner, the result was a nearly instantaneous outward snap of the tail." In the summer of 2006, Corvette engineers took some cars to Grattan to investigate Car & Drivers complaint. Ultimately they agreed and came up with a re-valved shock that was supposed be used for 2007 Z06 production but supplier issues delayed their deployment until late in March of 2007. Car & Driver included the Z06 in another test that same month and found its handling much more predictable. My Z06 (built in mid-March) missed getting the revised rear shocks parts by only a week or two. When I first got it, I was truly impressed with how stiff the suspension was. It was stiffer than my SS Camaro which has had a number of suspension upgrades including Koni Sport dual adjustable struts and shocks. Over time I decided that it might be a bit stiffer than I'd prefer so when part numbers for the revised Z06 shocks surfaced, I installed a pair. The factory service manual says to disconnect the outer tie rod from the suspension. Instead, I put a bottle jack under the lower control arm and compressed the shock a few inches and then attached some heavy duty zip ties. I removed the upper bolts and let the suspension down and removal was simple. It was not difficult to compress and zip tie the new shocks prior to installation. There's nice install page called The McRat Method to C5 Shock Replacement. 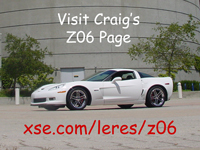 The car is a 2002 C5 Z06 but the procedure is similar. It's easy to tell the new shocks are slightly softer but they're still pretty stiff!